Barry Knowles and daughter Jo Morris during a training session in Swan View. This would not necessarily be extraordinary except he has the lung disease. Next month he will add another 350km to his total as he joins a Walk for Awareness and Research for the Asbestos Disease Society of Australia. Mr Knowles was diagnosed in early 2010. Together with a team of like-minded walkers, he and his daughter Jo will trek from Dunsborough to Perth. 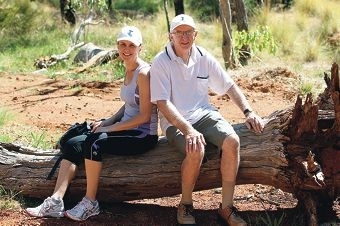 Last year he and his daughter walked from Kalgoorlie to Perth, with other walkers aged 17 to 84. ‘They had all been touched by these diseases in one way or other with one walker having lost several immediate family members,’ Mr Knowles said. He said the extra research funding was welcome; last year there was also an increase in the number of asbestos-caused malignancies, which included mesothelioma, lung cancer and asbestosis. Mr Knowles handled asbestos in the building industry all his working life. ‘To discover a prevention or cure for asbestos-related malignancies is one of the great challenges of modern medicine,’ he said. ‘Australia has the most enlightened and experienced asbestos diseases researchers in the world. Mr Knowles said Australian asbestos disease researchers needed to receive 15 to 20 million dollars a year to maintain their essential work. ‘In 2012 about 278 of our members and friends of the Asbestos Diseases Society of Australia passed away,’ he said. Mr Knowles said finding a cure and making people aware of the inherent dangers of inhaling asbestos fibres must be a priority to all members of the community. This time last year Mr Knowles and his daughter Jo raised $75,000 for medical research when they walked from Kalgoorlie to Perth. ‘Asbestos diseases are at epidemic number in Australia and there is an urgent need for medical research to save lives,’ he said.